Although they source grapes from several other places within Columbia Valley, their focus is on the Red Mountain AVA. Red Mountain is red wine country; Market Vineyards is a red wine winery. And so we dive into eight reviews of red wines by Market Vineyards. They do actually make one white wine and I got that out of the way in my last review: Market Vineyards Liquidity 2014 White Blend. Now let's get our share of polyphenols, shall we? 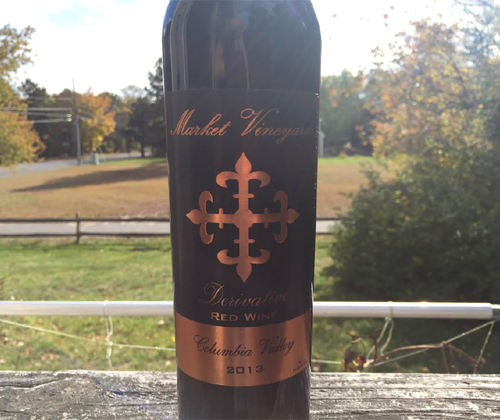 The blend for the 2013 Derivative is 40% Cabernet Sauvignon from Gamache Vineyards, 40% Cabernet Franc (30% from Gamache Vineyards, 10% from Red Mountain Vineyards), and 20% Merlot from Gamache Vineyards. Only 242 cases were made and the final ABV is 14.4%. Today's music selection is Smashing Pumpkins Radio on Pandora. How great of a band are they? I actually prefer their stuff at the tail end of their popularity when they got all industrial. Eye and Ava Adore are classics in my mind. This is probably a good time to announce that, since I talk often about the music I'm listening to while writing reviews, I've created a playlist on my YouTube channel dedicated to my music selections. So check it out if you want to hear what I've been tasting to! This wine is a purplish red in color. The nose has a bright red berry profile with some smoke and cedar, and the lingering threat of mocha. Nothing complicated. It's light bodied for a Cabernet blend, has a surprisingly bright acidity and sweet tannin. The high acidity brings bright and tart cherries on the palate but beyond that it gets rather dark with blackberries, black coffee and cola. The finish is rather creamy and it lasts much longer than I could have imagined with blackberries and cola. I'm once again put in a tough spot here. Do I like it? Yes. Is it worth $20? It's a bit overpriced for what it is but it's not like you're getting jacked. Keep in mind that Derivative is MV's entry level wine. 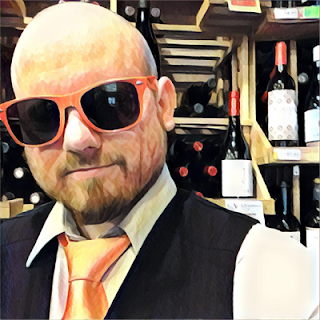 I know FOR A FACT that we're about to get into some seriously amazing stuff with Market Vineyards that will cause atomic sensory explosions because I've already written some of those reviews. But Derivative gets a Satisfying in price vs quality.